Thinking about renting out your home? If you are a Landlord who would like to rent out your property please contact the Housing Service for further information on 01252 774420. We offer a landlord incentive scheme to those who are willing to work with the council and rent their property to our clients. If you are already a landlord or property owner in Hart we can offer you a range of free services and an easy way to let your property. 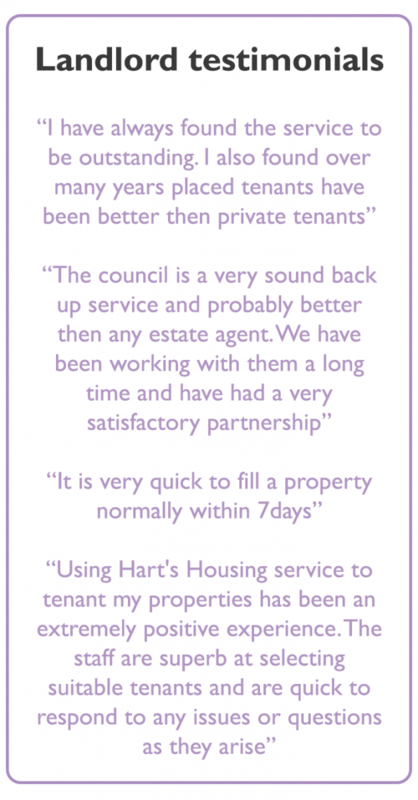 Why choose Hart District Council to let your property? For more information or to sign up to our free letting service please register your interest online. As a service to our landlords, we have partnered with the National Landlords Association (NLA) to provide you with free information when you register with the NLA Landlord Associate Scheme. Unlimited free downloads of tenancy agreements and a wide range of other essential forms and documents (many of which are editable online) and maintain your own personal tenancy agreement repository online. Receive invitations and free entry to landlord meetings. Receive a fortnightly e-newsletter to help you keep pace with developments in the private rented sector. Access to selected digitised pages from the NLA’s member magazine ‘UK Landlord’. Participate in NLA landlord surveys. Register your landlord accreditation on the National Register of Accredited Landlords, and gain national recognition for your work. If you are not already a member or associate of the NLA, to register as an associate all you need to do visit the NLA website and enter your contact details. We recommend that all landlords take this opportunity to keep up to date with ever changing rules and regulation, and to use reliable forms and letters, drafted by the industry’s largest landlord association. For more advice on being a landlord visit the Gov.uk website. Hart District Council is keen to support people to bring empty properties back into use and there are a number of ways that we can do this. We use information from our council tax records to identify properties that are empty for more than six months and will endeavour to make contact with home owners to discuss their property and the support we can give to help them bring it back into use. If you are the owner of an empty property and would like help bringing it back into use you can find out more information from our Empty Properties leaflet. If you would like to report a property that you think is empty then please do so using our Empty Property Reporting Form. If tenants or landlords are not happy with the service they receive from letting and managing agents they can complain to one of the three government-approved redress schemes. Letting Agents and Property Managers – Which Government approved redress scheme do you belong to? From 1 October 2018 the law is changing around the licensing of houses in multiple occupation (HMOs). At present a HMO must be licensed if it has three or more storeys and is occupied by five or more people. The Government has extended the scope of mandatory HMO licensing. This extension will apply where certain HMOs are occupied by five people or more in two or more households, regardless of the number of storeys. This includes any HMO which is a building or a converted flat where householders lack or share basic amenities such as a toilet, personal washing facilities or cooking facilities. It will also apply to purpose built flats where there are up to two flats in the block and one or both are occupied as an HMO. For more information on how to apply for a licence contact our Private Sector Housing Team on 01252 774420 or email housing@hart.gov.uk. You get a £75.00 reduction if you are a member of the National Landlords Association (NLA) and any other association affiliated to the National Federation of Residential Landlords (NFRL). Please note this is currently under review. You can pay online for your HMO fees. If you would like to feedback on the service you have received by the Landlord Liaison Officer please use our online feedback form.